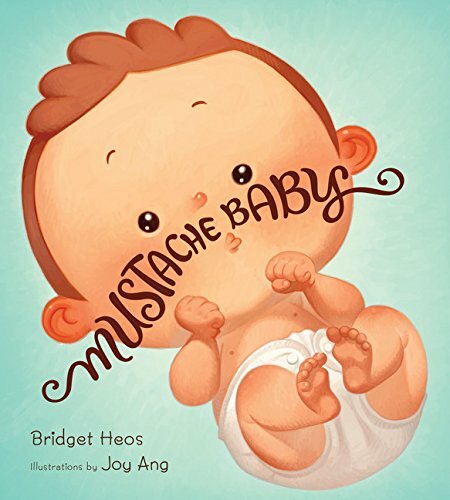 This nonsense picture book is about a baby who is born with a mustache. As Billy grows up, the mustache informs his various identities: cowboy, ringleader, Spanish painter, sword fighter, and man of the law. But then, it grows and curls and becomes a bad-guy mustache. Billy then becomes a cereal criminal, a bank robber, and a cat burglar, and gets thrown in jail. Fortunately, his parents are able to reassure him that everyone has a bad-mustache day. Billy becomes a good guy again and scoots off to play with his new neighbor, a little bearded guy. Digitally rendered illustrations are saturated matte cartoons. For the most part, they mirror the text, although the humor is often in the contradictions; while the narrator claims that "everyone loved having Officer Billy around," for example, his sister and brother glare at him for ruining their play. Quite a clever story. Well done Bridget Heos! I had never read anything like this before so once I heard about it I ran to Chapters to get myself a copy. I loved the illustration and the story is clever. Billy was clearly interesting from when he was born. Helloooo! He had a mustache and it was a mustache that came with an attitude (haha). "good guy mustache or bad guy mustache". I don't want to give away too much. I loved it. My young 2.5 yr old also loved it and loved the pictures. However, my spouse wasn't too into it. I realized she does not really get mustache jokes/the cowboy-ish mood. So does that mean boys may appreciate this book more than girls? I don't know! I think anyone can enjoy it (both boys and girls) as long as you can enjoy a sinister mustache when you see one. Anyone else read this book? What did you think? Can you recommend any books like this one? Content: Lovely illustration, funny character, clever plot, FUN.